THE B-MOVIE NEWS VAULT: The Complete Critters Franchise Makes Its Blu-ray Debut on November 27th! The Complete Critters Franchise Makes Its Blu-ray Debut on November 27th! THE CRITES ROLL ONTO BLU-RAY FOR THE FIRST TIME EVER IN THIS AWESOME NEW SET FROM SCREAM FACTORY! CRITTERS has long been a favorite of yours truly, and I can't wait to receive my boxed set on Tuesday the 27th! Dreamed up by The Chiodo Brothers (KILLER KLOWNS FROM OUTER SPACE), the carnivorous piranha/hedgehog hybrids from outer space appeared in four feature-length movies, a fan film, and are supposedly invading TV next year! Let's take a closer look at Scream Factory's new CRITTERS boxed set and rejoice at the possibility of a crites renaissance! Synopsis: It's no picnic for the Brown family when a lethal litter of carnivorous aliens arrives unannounced at their Kansas farm. Trapped in a deadly nightmare, the terrified Browns fight for their lives against the attacking bloodthirsty monsters. But it's a losing battle until two intergalactic bounty hunters arrive, determined to blow the hellish creatures off the planet! It's an alien adventure, full of action and just crawling with CRITTERS! NEW! Audio Commentary With Producer Barry Opper And Star Don Opper! NEW! Audio Commentary With Critter Designers Charles Chiodo, Edward Chiodo, And Stephen Chiodo! NEW! They Bite! 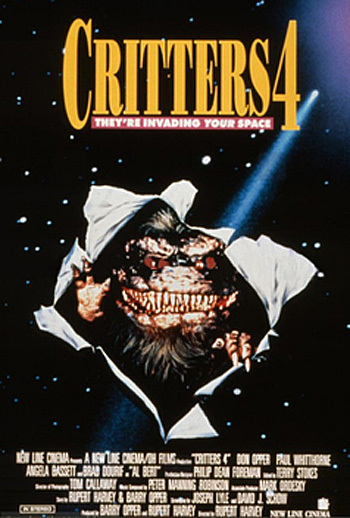 : The Making Of Critters - Featuring Interviews With Actors Dee Wallace, Don Opper, Terrence Mann, And Lin Shaye, Producer Barry Opper, Writer Brian Muir, Critters Designers Charles Chiodo, Edward Chiodo, And Stephen Chiodo, Make-Up Artist R. Christopher Biggs, Special Prop Supervisor Anthony Doublin, Composer David Newman, Second Unit Director Mark Helfrich, Critter Voice Actor Corey Burton, And Miniature Effects Supervisor Gene Warren Jr.! NEW! For Brian: A Tribute To Screenwriter Brian Domonic Muir! Synopsis: It's been two years since the fiendish Critters first terrorized the town of Grovers Bend and sent the Brown family packing. But the "boy who called Critter," Brad Brown (Scott Grimes - Family Guy, The Orville), is back … and just in time. Critter eggs have been hatching lethal litters, and the bloodthirsty hairballs are eager to partake in their favorite pastime – eating. In no time, the eggs are popping open everywhere – a field full of livestock becomes a gigantic feeding ground, and local residents are disappearing by the mouthful. Fortunately, three bounty hunters from space, Ug, Lee and Charlie, are flying back to eradicate the problem. But can they wipe out the Critters before Grovers Bend is erased from the map? With outstanding special effects, CRITTERS 2 delivers a fine repast of morbid mayhem! NEW! 2K REMASTER OF THE FILM struck from the original film elements! NEW! Audio Commentary with director Mick Garris! NEW! 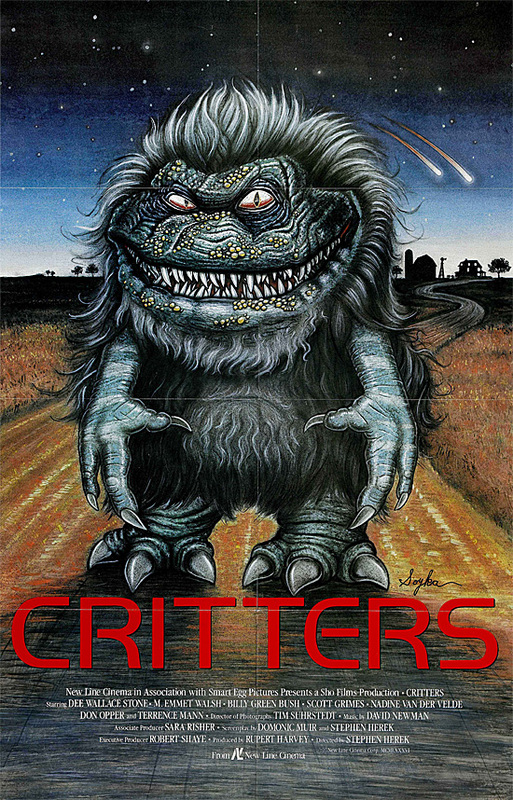 Audio Commentary with Critters designers Charles Chiodo, Edward Chiodo, and Stephen Chiodo! NEW! 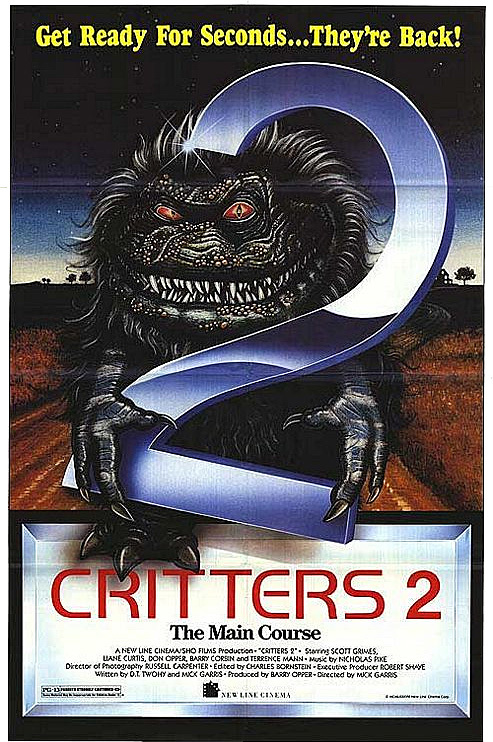 The Main Course: The Making of CRITTERS 2 - Featuring interviews with director Mick Garris, actors Liane Curtis, Don Opper, Terrence Mann and Lin Shaye, producer Barry Opper, Critter designers Charles Chiodo, Edward Chiodo and Stephen Chiodo and make-up artist R. Christopher Biggs! Synopsis: First, they destroyed a farm. Then they destroyed a town. Now they're ready to do some REAL damage! Leonardo DiCaprio (DJANGO UNCHAINED, THE REVENANT) stars in the third and most outrageous installment of the classic cult tale of the infamous CRITTERS. As the fanged, furious furballs viciously invade an L.A. apartment building and sink their teeth into the low-rent tenants, Josh (DiCaprio) leads the battle to beat back the conniving critters and save the planet. It won't be an easy job, but he's the one person the human race must depend on to destroy these terrifying alien hedgehogs once and for all! NEW! 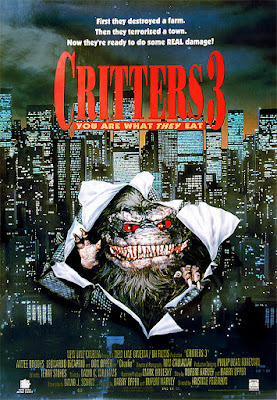 You Are What They Eat: The Making of CRITTERS 3 - featuring interviews with producer Barry Opper, screenwriter David J. Schow, stars Don Opper and Terrence Mann, director of photography Thomas J. Callaway and Critters designers Charles Chiodo, Edward Chiodo and Stephen Chiodo! Synopsis: They've returned home …. to outer space! The CRITTERS are back in this supercharged sci-fi space adventure! But these are no ordinary Critters – they're a super strain of genetically engineered mutants designed to take over the universe! This time, they're hungry to conquer the galaxy, with an appetite for mankind that's out of this world. Joined by Angela Bassett (BLACK PANTHER) and Brad Dourif (CHILD'S PLAY), Don Keith Opper and Terrence Mann reprise their popular roles as they battle for survival against the Critters, a nuclear meltdown and the fate of the universe! NEW! Audio Commentary with producer/director Rupert Harvey! NEW! Space Madness: The Making of CRITTERS 4 - Featuring interviews with producer Barry Opper, screenwriter David J. Schow, stars Don Opper and Terrence Mann, director of photography Thomas J. Callaway, Critters designers Charles Chiodo, Edward Chiodo and Stephen Chiodo! The new 2K transfers of the first two CRITTERS films, plus the new audio commentaries and making-of featurettes for each film make this a definite must-own in my book! 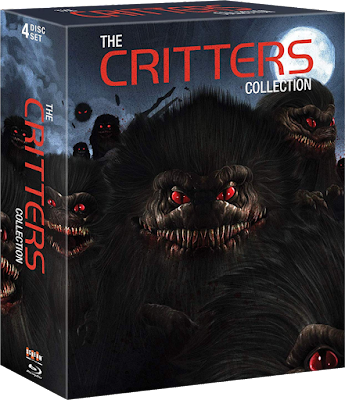 Scream Factory's THE CRITTERS COLLECTION will be available on Tuesday, November 27th, and should cost between $58 - $60! Go ahead and treat yourself (you've earned it!) 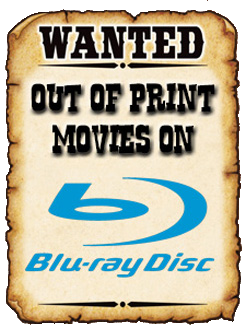 and get your very own set now from AMAZON, BULLMOOSE, DIABOLIK DVD, or directly from SHOUT! FACTORY. Speaking of which, if you do go with Shout!, you will get TWO 28.5" X 16.5" custom lithographs (limited to 1,000 each) and your set will come housed in a rigid slipcase! I hear they are selling fast, so order ASAP! STOCK YOUR VAULT: New DVDs for 11/13/2018!